Zentyal 5.0 review – Despite his fondness for the command-line, Shashank Sharma quite appreciates the point and click interface offered by Zentyal. » An Ubuntu Server-based distribution that’s designed to ease the process of fetching, installing and configuring various server- related roles and services. Unlike a regular server distro, Zentyal uses a graphical interface which also ensures all services are tightly integrated and deployed correctly. See also NethServer and ClearOS. With its intuitive graphical interface to aid the setup, you can have a working server in a fraction of the time it would take to set one up manually. The distro has a low barrier to entry and an impressive list of supported servers. In addition to the core components and repositories (repos). Zentyal also borrows Ubuntu’s installer. After installation, Zentyal boots to a minimal graphical desktop. However, you can install it on a headless server and configure it from a browser-based interface which you can access from any computer on the same network as the Zentyal server. When you access the browser-based administration interface for the first time, you’ll be taken through a brief installation process to help install and set up the various components of the server as per your requirements. You can safely skip this installation at this point and configure the components at a later stage. You can add Zentyal 5.0 repo to an Ubuntu server installation and pull all the components and admin interface with a simple apt-get install command. Zentyal isn’t an all-purpose server and bills itself as server for small businesses. This means that you can use a Zentyal installation as a domain and directory server for filtering email, scanning for viruses, managing printers, deploying webmail, VPNs and other core infrastructure services – such as DNS and DHCP – and for issuing and managing secure certificates. Once installed, you can configure these services from the comfort of the web interface. Zentyal has a polished user interface and its components are nicely integrated, so you can configure the available components either individually or as a collective using the Server roles option. Surprisingly, the distro doesn’t offer an option to install and configure a web server, but you can set up Apache from its Ubuntu repos though, you’ll have to configure it the old-fashioned way. using the command-line. While it isn’t too complex to set up. Zentyal offers plenty of options if you need some hand holding. The project has a detailed wiki that’s got all the information you need to use and set up the distro. There are also active forum boards which are rife with tips and tricks from other users. Besides the freely available Development edition. Zentyal also offers a commercial edition for larger setups which you can test drive for 30 days. If you are looking for a point and click server deployment, Zentyal isn’t the only game in town. Moreover, compared to some of its peers Zentyal offers the least number of server options. Its contemporaries, namely ClearOS and NethServer. provide just about all types of server and network services. Apart from everything you get with Zentyal, these alternative distros let you deploy the usual LAMP. mail. FTP, file and print services. They also have additional provision to roll out web and mail proxies, chat servers, time servers and even a fax server. We’d advise you to compare all three options before choosing one. That said, if Zentyal’s comparatively limited options are enough to serve your needs, then there’s no reason to look elsewhere. 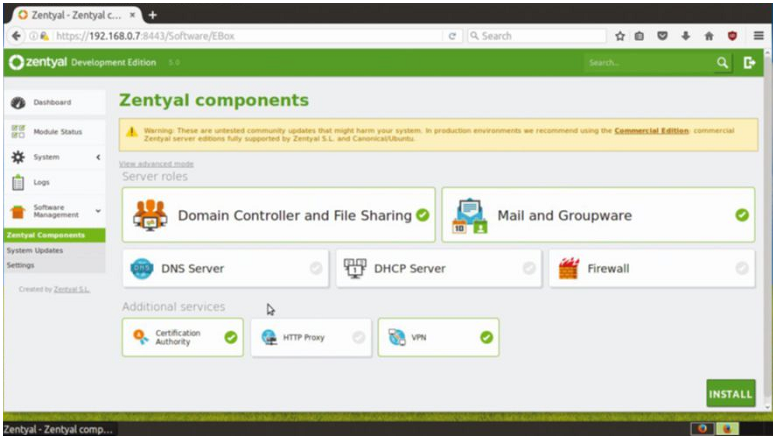 » Easy to install and configure, Zentyal can deploy a limited number of services compared to its peers. Everything is managed via a browser-based interface from the base distro to the individual components. The project is backed by an active community flush with resources to help orient new users.